Posted on 2 September 2012, in MacGDBp. No Comments. MacGDBp 1.5 has been released. This update fixes a crash on 10.8 when adding a breakpoint. Credit for the fix goes to Paul Mitchell and Sam Fleming. Full details are in the changelog. Posted on 28 April 2011, in MacGDBp. 5 Comments. MacGDBp 1.4.1 has been released; this is a maintenance update that fixes a few bugs. I meant to get this release out a few weeks ago, but I’ve been travelling recently and didn’t have the time. You can download MacGDBp 1.4.1 from this page. Please file any new issues in the bug tracker. Posted on 26 February 2011, in MacGDBp. No Comments. After a slight delay trying to track down some bugs, I’ve decided to push MacGDBp 1.4 to stable distribution. While this release is not quite perfect and there are a few known issues (listed on the project page), I was tired of blocking the release on relatively minor bugs. This release has been a year in the making, and it makes significant improvements over the 1.3 branch. To find out more about what went into making this new version, check out some of the older posts on the blog. You can download MacGDBp 1.4 from this page. Please file any new issues in the bug tracker. Update: A minor bug had to be fixed with the released package. I’ve pushed a new binary and the few people who have downloaded the update will be prompted to update again. Posted on 15 January 2011, in MacGDBp. No Comments. I’m happy to announce MacGDBp 1.4 Beta 2. It’s been nearly a month since the first beta was released and more than 200 people have tested Beta 1. I haven’t received any critical bug reports, which means that the internals are stable enough to ship. Beta 2 is the Release Candidate; barring any significant issues, this will be promoted to Stable in a month or less. You can download MacGDBp 1.4 Beta 2 from this page. Please file any new issues in the bug tracker. Posted on 18 December 2010, in MacGDBp. 1 Comment. I’m happy to announce the first beta of MacGDBp 1.4. This release represents nearly a year’s worth of work rewriting the entire internal structure of the application. As mentioned previously, MacGDBp 1.4 now communicates to the backend in an asynchronous manner. Not only does this change increase the robustness of the program, it should no longer beachball while waiting for responses from Xdebug. Because it took such a long time to stabilize this branch, there is very little in the way of new features for this release: almost all the work for this release was done for making the network changes and increasing stability. One new point to be aware of is that the concept of “reconnect” is gone in this version. 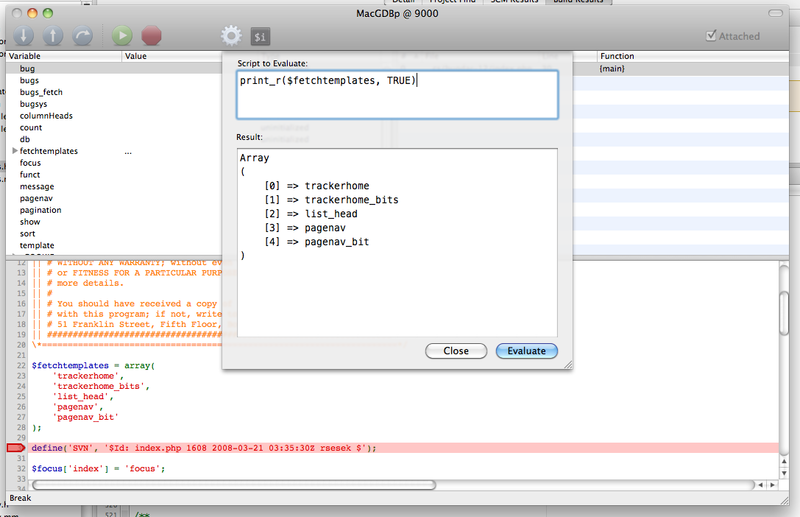 Instead, the debugger is now either attached to the backend or is detached. When attached, MacGDBp will start debugging any connections from Xdebug. When detached, MacGDBp will send the “detach” command immediately after receiving any new connections, aborting the debug. You can download MacGDBp 1.4 Beta 1 from this page. Please try out this new version and file any new issues in the bug tracker.